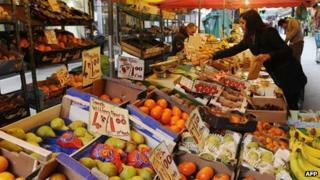 The eurozone "lost some momentum" in November, a survey says, with private sector activity slowing slightly. The Markit composite purchasing managers' index (PMI), which tracks several sectors, slipped to 51.7 from 51.9 in October. But the figure beat expectations, and the PMI reading stayed above 50, indicating expansion. In Germany, composite PMI hit a 29-month high as firms hired more workers to meet the demands of new orders. In Spain, the service sector returned to growth and the sector saw its biggest increase of new business since 2007. But other readings indicated France was at risk of going back into recession, with an all-sector reading of 48 - a five-month low. Italy also worsened markedly from the month earlier with a composite PMI reading of 48.8. Analysts say the eurozone is showing signs of a split as the economic picture picks up in some countries but slows elsewhere. "The final PMI data confirm that the euro area's recovery lost some momentum in November," said Markit's chief economist Chris Williamson. "It's clearly a concern that the rate of growth remains so fragile." Meanwhile, retail sales in the eurozone fell 0.2% in October, following a decline of 0.6% in September, said Eurostat, the European statistics agency. And growth in the eurozone was confirmed at 0.1% in the third quarter, a slowdown from 0.3% growth in the previous three months, according to Eurostat. The eurozone shrank 0.4% compared with the same period the year before.